A combination of organic herbs, vegetables, spices and sea salt, used to add flavour in cooking or as a spicy table salt. Herbamare Spicy is made from sea salt, fresh herbs and vegetables from organically-controlled crops and the seaweed kelp, which is a source of minerals and iodine. Unlike Herbamare, Herbamare Spicy contains chilli and pepper, which gives it its spicy taste. Fresh quality herbs and vegetables are blended with sea salt. After a unique 12 month steeping process the mixture is gently dried to produce this spicy seasoning mix. Sea salt (89.7%), vegetables, herbs and spices (celeriy*, leek*, cress*, onions*, chives*, chilli*, pepper*, parsley*, lovage*, garlic*, horseradish*, basil*, marjoram*, rosemary*, thyme*), kelp (with trace iodine). 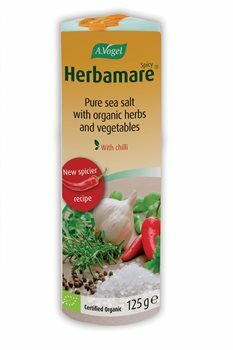 Herbamare Spicy makes an ideal seasoning salt for all manner of piquant and spicy dishes such as barbecues, Mexican and Indian dishes, pasta, pizza, lasagne and much, much more. Herbamare spicy contains no artificial flavourings or lactose; it does not contain gluten. Thank you to Healthstuff for handling my order so quickly! Hi there, I am going to be purchasing this as a gift. Can you confirm it is definately vegetarian? HealthStuff Replies: Yes this product would be fine for a vegetarian. Here is a list of ingredients: Sea salt (89.7%), vegetables, herbs and spices (celeriac*, leek*, cress*, onions*, chives*, chilli*, pepper*, parsley*, lovage*, garlic*, horseradish*, basil*, marjoram*, rosemary*, thyme*), kelp (with trace iodine). * Certified Organic by QAI.